It’s too soon to say which of his Labour colleagues will back him for the role, Kelly said. 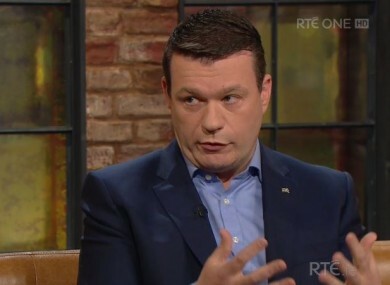 LABOUR’S ALAN KELLY appeared on the Late Late Show couch this evening to discuss – amongst other things – his leadership ambitions. As you may have noticed, the Tipperary politician has barely been out of the political headlines in the past few weeks. He’s rarely missed an opportunity to hit out at his former coalition colleagues – whether it be launching an attack on the Fine Gael deal with Fianna Fáil on water, or noting that just one TD from Enda Kenny’s party had turned up to hear him speak during a climate change debate. Speaking earlier this week as Joan Burton announced her impending resignation, Kelly wasn’t giving much away about his leadership ambitions. But then again, this is a man who infamously once described power as being “a drug” and “attractive” – so his decision to confirm that, yes, he was interested in the Labour top job tonight came as no major surprise. “I plan to,” he responded to host Ryan Tubridy, when asked if he would be putting his name forward (after noting, it should be said, that he was booked for the show before Joan made her announcement). Labour had no mandate to enter government after the result of the general election, he said – as the party had been reduced to just seven TDs after a near electoral wipeout. He added that he hoped a consensus on a new leader could be reached by the parliamentary party as a whole. However, as Tubridy pointed out, the likes of Brendan Howlin and Seán Sherlock have also been linked with the leadership – so how could Kelly be sure of being nominated and seconded? The interview took a slightly odd tack after that as the TD asked the Late Late host whether he planned to present his TV show next week. Read: Can people who paid their water charges sue the government for a refund? Email “Alan Kelly will go for Labour top job - but he's not sure who'll nominate him ”. Feedback on “Alan Kelly will go for Labour top job - but he's not sure who'll nominate him ”.